This superb pipe stem from Alaska, circa 1900, in two sections, is finely engraved on both sides with a continuous frieze on one side depicting a highly detailed fish, a man in a canoe wearing a hunting hat, with catch and harpoon, a group of walruses, salmon and other fish. 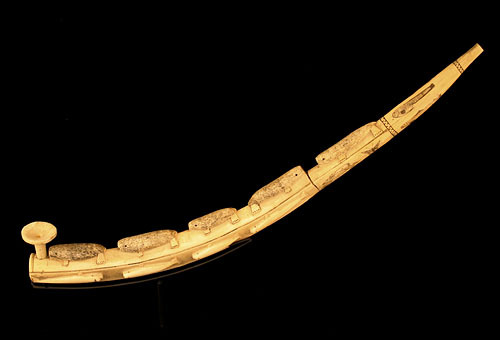 The top of the pipe depicts five sea otters carved in high relief and finely engraved. The opposite side depicts four whales finely carved in relief, followed by an engraved rabbit running, a butterfly, and a salmon. There are also various geometric devices engraved around the mouthpiece section, and at the bowl end section. The bowl is carved separately, and is removable. Provenance: From a private Northwest American collection.